MEMBERS of a drugs gang who used luxury hire cars to deliver heroin and crack cocaine across Blackburn have been jailed for a total of 24 years. The street dealing network was smashed when a brave police officer managed to climb through the window of a car as it sped away from a roadblock. Detective Sergeant Andy Osbaldeston stopped the vehicle – and the gang’s crimes unravelled. It was discovered one of the men in the car had swallowed 15 wraps of the drugs in a bid to hide the illegal substances. As police carried out further inquiries they uncovered a series of similar incidents across Blackburn in which hire cars had fled police trying to flag the vehicles down. Using evidence from 27 days of observations from both patrol and plain clothes officers and calls from residents, detectives pieced together two years of drugs dealing involving eight Blackburn men. Police said the men used some of their profits to to hire high-class cars such as Audi A3s and A4s, BMWs, and Mercedes. Members of the street dealing network were seen pulling up on streets to make suspicious transactions from their cars. Preston Crown Court was yesterday told that blatant drug dealing took place at all times across the town in such areas as Roman Road, Rawsthorn Street, Bennington Street, Wimberley Street, Westbury Gardens, Pringle Street, Willow Street, Whalley Old Road, and Preston New Road. Police believe the unusual method of distributing drugs was designed to disguise their illegal activity. Yesterday six members of the gang were jailed for a total of more than 24 years. They pleaded guilty to conspiracy to supply class A drugs while two other men admitting being concerned in the supply of Class A drugs. Ringleader Mohammed Tasawar, 25, of Queens Road, Blackburn, used his full, clean driving licence to hire the majority of the cars and was dealing for ‘commercial gain’. The married dad of one was sentenced to five years in his absence. He is currently in Pakistan tending to his ill grandfather and will be jailed on his return. His ‘trusted lieutenant’ Zafar Iqbal, 24, also of Queens Road became addicted to cocaine aged 14, contributing to a bi-polar disorder and a 5g a day habit. He was jailed for four years eight months. Rameez Hussain, 23, of Cambridge Close, Blackburn, was jailed for four years and four months. Riyaaz Yusuf, 23, of Thornhill Close, Blackburn, hired six of the vehicles used in the network under his own name. He was jailed for three years and four months. 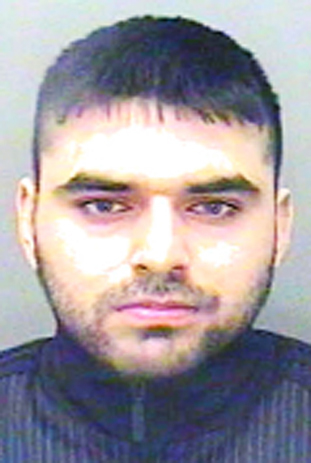 Father-of-one Yasar Hussain, 25, of Cumberland Street, Blackburn, was locked up in 2003 for drug supply as a teenager. Fellow conspirator Ishaq Mehuddin, 23, of Irving Place, Blackburn, was jailed for three years. Nadim Afzal, 24, of Queens Road, and Zaheer Mirza, 23, of Azalea Road, Blackburn, both claimed to have only been present in a car during a single transaction and were both given suspended sentences. The court heard the operation was smashed when DS Osbaldeston pulled over a Volkswagen Passat. But as he approached and opened a door, it mounted a pavement and drove off, with the officer sprinting alongside. As it approached a line of parked cars, the officer had to fling himself inside the moving vehicle seconds before being crushed. It was being driven by ringleader Tasawar with passenger Iqbal who had swallowed all but one of 15 wraps of crack cocaine and heroin. After the case, a spokesman for A&S Car Hire in Blackburn which rented out the cars said they ‘did not suspect’ what the gang were up to. He said: “We co-operated fully with the police and handed over our books. “We just thought they had extra cash to burn and were showing off in fast cars – it is a fashion among some young men. “They had to show a driving licence and proof of address. If they flee the country, we should deport every relative of these scumbags. Deport their mothers, fathers, wives, children. Tommy Robinson wasn’t given the chance to abscond – the locked him up on remand for months, for using a passport that belonged to someone else. But murderers, child-rapits, druglords are all allowed to flee the country. Provided they have a Pakistani passport. Yes. I’ve just remembered of a friend with no history of violent crime, who’d never been banned from driving, who was remanded for almost 3 months before his court case for a driving incident (it was related to a marital dispute, where his wife had been having an affair with another man). When it came to court he was sentenced to something like 6 weeks. But racist murderers, child rapists, etc. who can flee to a country from which they cannot be extradited are not remanded.